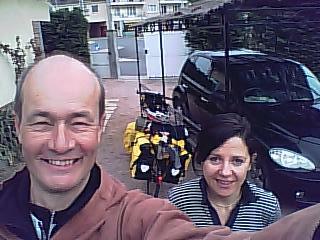 Warm thanks to Nathalie (sorry for the spelling) and to Anne in Vichy for the most wonderful welcome. Nathalie takes in foreign language students; and I guess I count with my struggling French. And Anne, sadly not pictured, is perhaps France’s leading trainer in journalism and trauma. Hence the connection. And thanks too to Pascal, Anne’s doctor husband, for sorting my Achilles tendon. Which was playing up so much I thought at one point it might jeopardise the entire trip. Drugs do work sometimes after all.